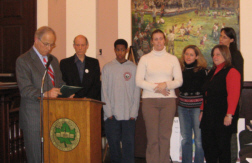 Maplewood Mayor Fred Profeta reads Be About Peace Day Proclamation as SMPA chair Paul Surovell, Jackson Roberts (creator of Be About Peace slogan and graphic), Amanda Schroeder (sister of Marine Lcpl Augie Schroeder) and Be About Peace Day 2007 coordinators Donna Welsh, Beth Boily and Carolyn Smiley look on (Feb 6, 2007). The Maplewood Township Committee also passed a resolution calling for US withdrawal from Iraq. 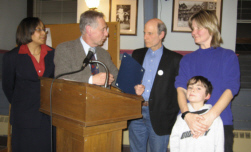 South Orange Trustee Terriann Moore-Abrams and Village President William Calabrese present Proclamation to Paul Surovell, Ginny Brown and her son Daniel who accept on behalf of South Mountain Peace Action (Feb 21, 2007).